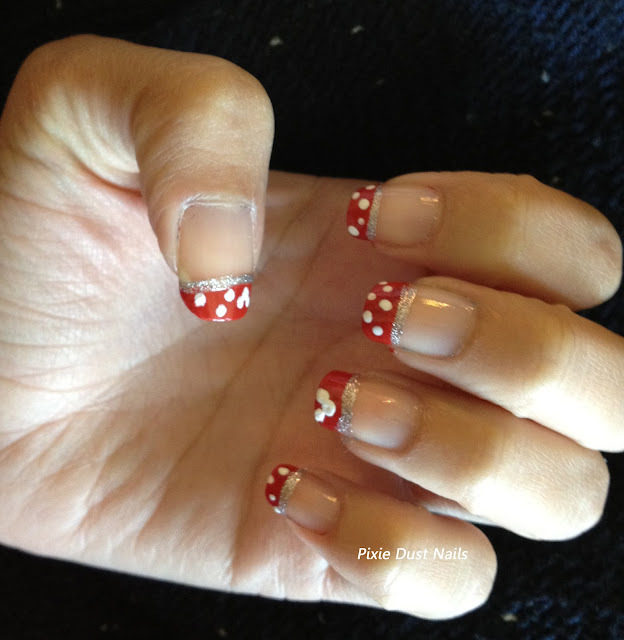 Today we have a special guest post from Nerissa with Pixie Dust Nails! Pixie Dust Nails showcases tons of cute Disney-inspired tutorials for your nails. Some of the stuff Nerissa comes up with is so clever (check out her “backside of water” nails)! I hope you enjoy this special take on the popular bridal French manicure she put together especially for my readers. 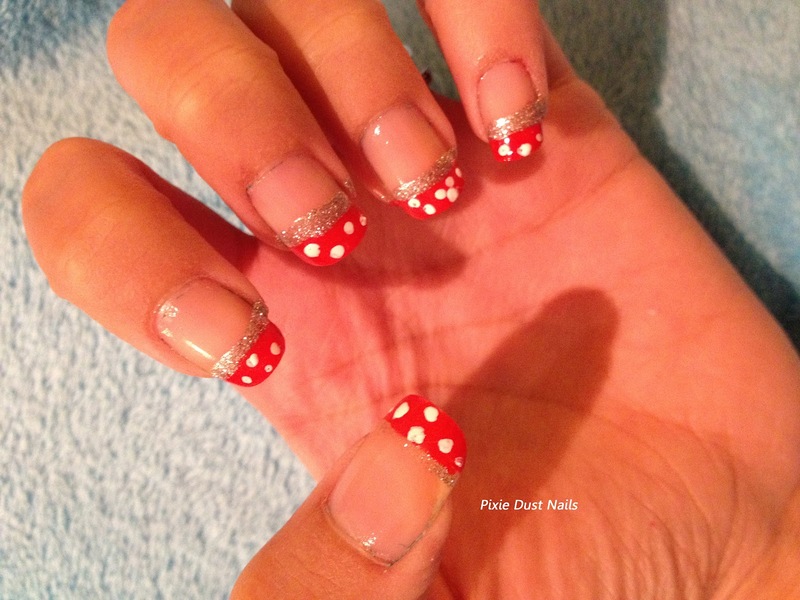 Be sure to check out Pixie Dust Nails and leave some love! 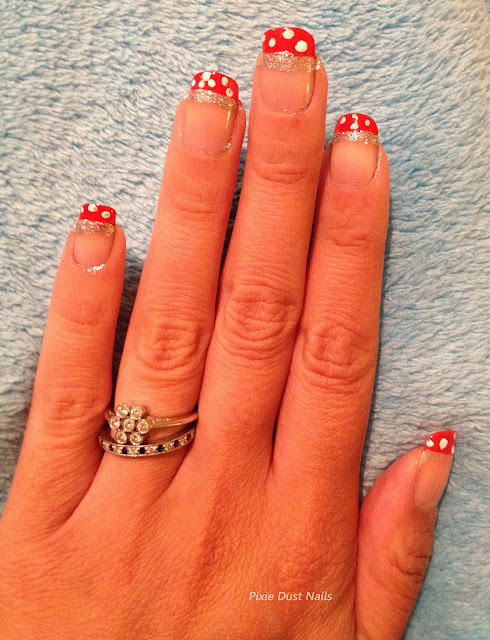 This is a fun manicure I thought would be great for a Disney bride or her bridesmaids! It’s a French manicure with a touch of Disney that you and your bridal party can do yourself! • 3 Polishes in the colors you chose. I used Red (OPI “Off with her Red”). My other two colors were white and silver which I got out of a Kiss Nail Artist Paint Kit. I love these! Each color comes with a thin brush that is useful for painting designs. Step one: Pick your colors and collect what you’ll need! For mine I decided to make it look like Minnie’s red and white dress but you could do your own version in your wedding colors if you prefer! Step Two: After getting your nails shaped the way you like them with a nail file, paint all your nails with your clear base polish. Step Three: Once the clear coat is completely try, cut a strip of scotch tape and place it on the base of the nail so that all that shows is the tip that you want to paint in. (Try not to leave too little space or it will become difficult to paint on dots later). Step Four: Paint in the top end of the nail that’s not covered by the tape. 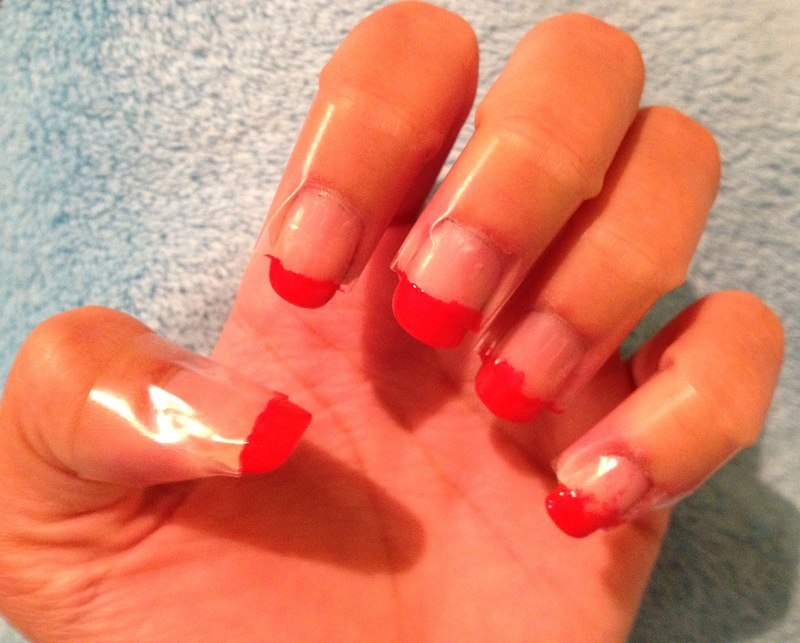 The scotch tape catches the excess polish. Step Five: Once it’s completely dry, use your dotting tool or the end of a small bobby pin to add the dots on top. If you like, make one or two hidden Mickeys! I did one on my ring finger. 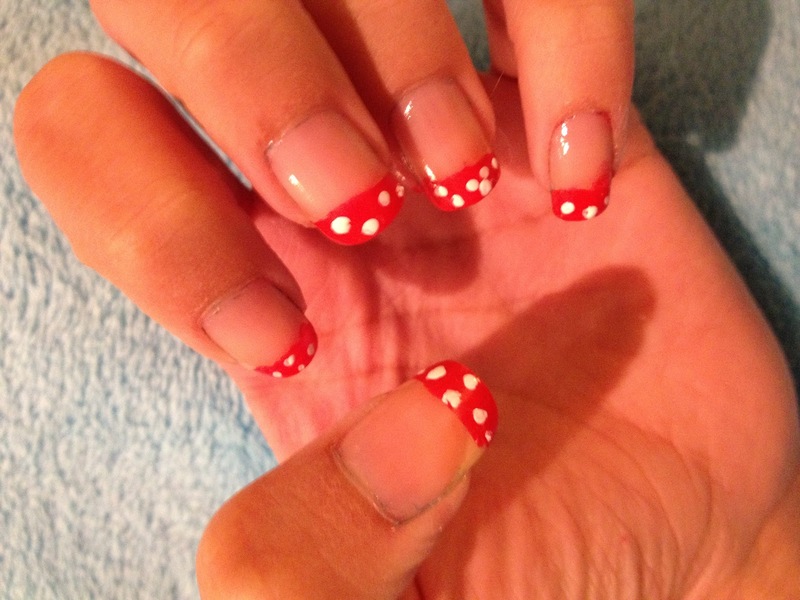 Step Six: Once the dots are completely dry, carefully peel off the tape that is on the base of the nail. The excess polish should come with it. Step Seven: Afterwards, I used the silver polish and a thin brush to carefully paint a straight line across the bottom of each design on the nail. Step Eight: Let the silver polish dry and then top it all off with a clear top coat! This design took a little bit of time but I think the finished look was worth it! Nail art can be such a fun way to add in a unique detail to your wedding! What do you think of this fun nail tutorial? Would you let your bridesmaids rock Minnie nails on your big day? What colors would you choose? so cute  love the pop of glitter underneath. Thanks Neri for the How To!! !